Runners Connect » » Nutrition Articles How Much Protein Do You Need to Stay Healthy as a Runner? How Much Protein Do You Need to Stay Healthy as a Runner? Runners know by now that we need to pay attention to the food we eat to recover fast and prevent injuries (or heal a current injury), and most of us know that protein is the best way to assist with the recovery process. But protein can be confusing. Protein is for weightlifters, right? What is the recommended amount of protein for a casual runner per day? Will protein make me bulk up and put on weight? How much protein powder should I take and at what times? 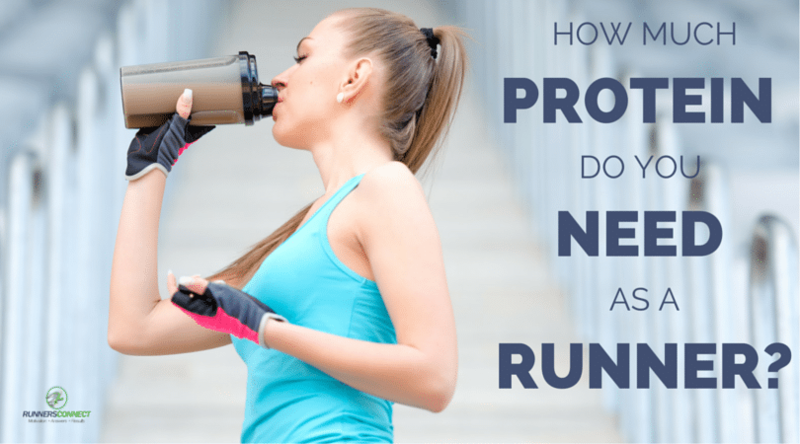 Are there benefits to taking a protein shake after a run? Does chocolate milk count as a protein recovery drink? What type of protein is best? It’s a lot to think about, but today, we are going to answer your protein questions (the ones you have asked us about!) and get you all the answers you need to be confident in what you are eating as a runner and how much protein you need to run your best. How Much Protein Do Runners Need to Train & Recover? Let’s start at the basics. Let’s imagine (wouldn’t it be nice!) that you are completely injury free, and you just want to know how much protein an everyday runner needs for their training. The amount of protein a person needs when they are not training is .8 grams (g) per kilogram (kg) of body weight. When you add in endurance or resistance training, your need for protein increases. 1.2 to 1.7 g of protein per kg of body weight. If you fail to consume enough protein when training hard, your body will break down muscle to fuel your body on training runs. The goal with running is to build and maintain lean muscle mass, not break it down for fuel. Your weight in kg multiplied by recommended protein intake. How Much Protein Do I Need For My Training? Start at 1.2 g of protein per kg of body weight. If you feel great and you are recovering quickly, this is the perfect amount for you. If you are not recovering well or find you keep getting injured, you may need additional protein while you are training. Increase your protein uptake to 1.5g per kg of bodyweight. You can also change your protein intake based on the intensity of your training day. On easy recovery days or rest days, keep your protein intake to 1.2g. Keep experimenting with slight changes in your protein intake until you notice a positive difference in your recovery rate. Start at 1.4 g of protein per kg body weight and apply the same process as the 10k-1/2 marathon group. Give yourself about a week at each protein level to determine if it is the right amount for you. Don’t feel like you have to watch every gram you consume. As long as you stay within a range of about +/- 10g of protein from the suggested amount for your body weight, your recovery will be fine. Won’t Protein Cause Me to Put on Weight or Bulk Up? All runners are hyper aware of their weight and body size. Most of us know that every pound counts, and additional pounds increase stress on our joints and require more energy with each mile we run. It’s also a common myth that carbohydrates are king and protein is for weightlifters. Protein, in and of itself, doesn’t increase muscle mass. So, what does make us bulk up? Heavy resistance training, in combination with a high protein diet, will increase muscle mass and weight. Endurance training with the correct amount of protein will simply facilitate faster recovery and allow you to train harder on workout days by repairing and growing lean muscle mass. Is Chocolate Milk a Good Recovery Drink for Runners? Chocolate milk has been toted as a great recovery drink for runners, but is it really all it is cracked up to be? This isn’t terrible, but chocolate milk does lack a few key amino acids essential for optimal recovery. Chocolate milk does not provide the body with the amino acid L-Glutamine, which can boosts the immune system and can help manage aches, pains, and soreness by reducing inflammation. How does chocolate milk compare to a protein shake? In addition to having more than three times the amount of protein, less fat and 3 times less sugar, this specific protein shake offers 5,000 micrograms of L-glutamine. Calorie for calorie, the protein shake with blueberries is a healthier recovery drink than chocolate milk. If it is the chocolate you crave, there are plenty of options of high quality protein powders, supplements, and milk alternatives that come in a chocolate flavor. Do I Need A Protein Supplement? Determining whether or not to take a protein supplement depends on what your traditional days look like. Here is a typical 2500 calorie day, for a 160 pound male, who runs moderately (5 days a week), but works a sedentary job. As you can see, 82g of protein is 20g of protein less than the 160 pound man in this scenario needs to consume. If this 20 g protein deficit continues over a series of days, his body will not be able to rebuild or repair the muscle fibers and he will start to lose muscle mass. He may notice an increase in general fatigue and a slowing of his typical easy run and workout pace. Obviously, these are outcomes runners desperately want to avoid. Adding a protein shake or a protein bar is an easy fix for this protein deficit diet. If adding a shake takes too much time in your busy schedule, try mixing some protein into your morning oatmeal and grabbing a protein bar for a snack. See the article I wrote on Healthy Energy Bars for Runners to find the bar that fits best with your daily diet and nutritional requirements. As you can see, getting enough protein to match the amount of running you are doing is very important, and it is something that often takes some planning. A typical diet doesn’t always supply enough protein for the serious runner. As you can see, protein intake varies on your individual circumstance, but hopefully this helps you understand how to figure out your best intake for your running. I feel that i am thinner than i should be and i think i am not taking the reauired protiens that my body needs. My body always tired and lazy the day after running. This is a great question. At your current body size, according to the BMI measurement, you are considered a healthy weight. As long as you are eating a balanced diet, your body should be able to handle 4km twice a week just fine. However, if you feel like you are thinner than you should be or would like to be and you are fatigued after your run, adding a protein shake post run, in addition to everything you are eating now would be a great option. If you are not a fan of protein shakes, simply increase the high protein foods in your current diet is another great option. We have now set up a treadmill in the tool room with just enough headroom and I run 3km in 18 min per day. I do not eat a lot of sugar but find myself craving it and lately have been binging on biscuits at night. I work 12 per day seven day per week for five weeks . Do I need a protein shake and on my 5 weeks off will i reduce the intake if my training is not as consistent? Your feed back is appreciated. Hard to say without knowing your current dietary intake, Mike. While your exercise routines sounds like it is less than you do when not on the boat, you’re definitely working hard and long hours, which might be burning more calories than usual. I run 7.5 miles x 5 days a day and I am upping the ante to 8.0 miles x 5 days from next week, I am 5’7 and weigh 122lbs. I take 72 gms of protein with around 400 mls of milk. I was wondering whether I should continue with the shakes (I think I am getting a bit chunky in the middle! albeit the rest of my is pretty lanky as my stats indicate), increase or decrease the protein intake. Thanks for the article is well, really really interesting read! Thanks for comment, Saad It’s hard to say without knowing your full diet, but given your weight, you need about 66-70g of protein per day. If you’re eating protein throughout the day, then you probably don’t need the extra shake. I would at least decrease by half, probably more 2/3rds. Hope that helps! Hi i am a 16 year old male, i run around 32km a week and compete in cross country races. I am 5ft7 and weigh around 58kg. i was wondering if taking protein would be beneficial or not? Hi Tom, hard to say without knowing your diet. Take a look at the suggested daily intakes suggested in the article and then add up all the protein you eat in a day. That should give you an idea of how close you are to the specific targets. I am 66 and I run 5 times a week, for about a total of 17 miles. How much protien should I consume? Hi Tom, that question can’t be answered unless we know your weight. As the article points out, your protein intake is determined by your body weight. Just wondering I’m 32 years old I run 16 miles a day 5 days a week and weigh 122 and I don’t eat meat. How much protien should I be eating/ drinking without putting on weight? For muscle recovery during endurance training, 1.2 to 1.7 g of protein per kg of body weight is optimal. Hi Coach, is any old protein ok for runners or should I be using a protein which is also high in carbs for recovery purposes?? Good question – I guess timing would be the most important element. If you’re looking to recover, I would go 4 grams of carbohydrate for every 1 gram of protein. Research has shown it’s the optimal recovery ratio. If you’re just adding protein to meet recommendations, I wouldn’t go out of my way to find carb sources. what is a good protein drink for running and working out? i am a 34 year old male 105kg and doing a marathon in october, i am about 4 weeks into my training program and my long runs are now getting above 10 miles. i am a little worried about taking protein shakes and getting the right ammount of carbohydrates. i stress very easy and worry about drinking shakes and taking energy gels then eating. I am a 17 yoa female cross country runner in high school. I eat oatmeal and fruit for breakfast, I try to eat peanutbutter and jelly for lunch, and banana at end of school before race. I am hydrating good. I run out of energy at the end of the race and sometimes feel lightheaded. I run 21 in a 5k and wiegh about 113. Will more carbs before the run get me through the end with more energy or will protein shake help in the begining of the day. I am not sure of the benefit of the protien. We train 5 days a week. I would definitely eat more. Your calorie consumption is very low. You should add more food to your lunch and maybe even have a snack before your run. Hi, I am 22 years old. I am a sprinter and am quite fast. I have decided to join gym and take protein shakes but i am worried if protein shakes would reduce my running speed. I just want to know if protein shakes will affect my running pace or not. Hi Abbas, protein will not reduce your speed. All protein does is helps to build muscle, meaning that it will probably help with your sprinting as you will build fast twitch muscles to run faster (if you are training them through running). However, it is always better to consume protein through natural sources over shakes as you have more control as to what is going into your body. This means lean meats, greek yogurt, chocolate milk, ect. Hope this helps! hi . i m 18 year old football player . i jog 8km 4 days in a week including trainning .. my body weight is 60kg and my height is 5’6.. can i take protien supplement .. if yes , then Arnold iron whey protien is a good option…. Thanks for your feedback Prabhat, you do not need a protein supplement for your running, but if you find it helps you feel better, then stick with what works! thanks coach tina for your above reply ..now, I want to ask that can i take neurabol 2mg capsules.. can neurabol helps me in increase my stamina …. plzzzz answer.. I am sorry Prabhat, but I do not know the answer to that. You will need to check with your doctor! Hello. I am 23 years old and have just started running. I weigh 150 and am 5’3. I want to get to the point where i can run a half marathon in November but i also have my first 5k coming up at the beginning of march. i am new to running and don’t have a clue about how much protein i should be taking in. especially because I’m only running 30min 4 times a week to start. i know i will need more protein as my running time increases but how much should i be taking now. I’m also trying to loss some weight and have started clean eating. thanks! Hi, I am 47 years old and have been running for about 14 years. I run five days a week and have been having more issues with muscle soreness, especially after speed workouts. Is there a certain protein shake that I can take that will help with recovery? im 25 year old male weight 87kgs 7 weeks into training for a marathon. running about 30 miles a week. I eat a fair amount if carbs and protein but think I need more protein. I’ve never had shakes or supplements. what would you recommend and how often should you have these shakes? before each run? I am running 3 times a week and do on average around 5-6 km per run with an average of 13-13.5 km per hour or average pace around 4.25/4.30 minute per km. Sometimes I run more than that which reduces my average speed a little, where 10 km is the maximum. I am not training for a Marathon, I am just running for regular excercise and to feel better in general. My height is 1.80 m and weight is 75 kg. I take 1 post run protein shake which contains: 380 kj, 91 kcal, 17g protein, 3g carbohydrate, 1.25g fat, dietary fibre 0.25g, 0.06mg sodium, 375mg CLA powder, 750 mg Flaxseed powder, 100mg green tea extract, 125mg Acetyl-L-Carnitine. As I am not very famillar with protein shakes or running I would like to know if it is necessary for me to take a post run protein shake and / or if it is healthy or not healthy. Thanks in advance and I am looking forward to your reply. Hi Valerius, it would be impossible for us to tell you exactly whether to take a protein drink. It would be better for you to take in a more natural form of protein through the sources we talked about in this article. Hope that helps! If you are using a protein supplement as a runner, are there specific things to look for? Most of them advertise big gains etc but is that irrelevant if the type of training you are doing isn’t based on resistance? There are so many on the market, it’s hard to know which one would work best. I recommend Optimum Nutrition 100% Whey protein powder. What you’re looking for is a supplement that contains as much pure whey as possible. The cheaper brands are cheap because they aren’t simply whey, but a bunch of other stuff thrown in to make the nutrition labels look high, but really aren’t absorbed. Optimum Nutrition has a variety of flavors that taste good, are very well reviewed, and are a good price. Hey, I am a 20 yr old women who is currently training for a marathon. I and 5’5 and 138 lbs. I try to eat as much protein rich foods as I can (eggs, chicken, spinach) but I seem to get fatigue quicker then usual, should I be consuming protein powder? And if so what kind and how often? Hi Krista, it does not sound like you need to add protein powder to your diet, especially if you have protein rich sources already in there. If you are fatiguing, it is most likely due to running your easy runs too fast. Check out this post for more:https://runnersconnect.net/running-training-articles/80-easy-makes-you-23-faster/ Hope this helps! I’m 45, female, a newbie runner and training for my first half marathon in October, followed by my first marathon in April next year. I eat a varied, clean diet and try to eat protein rich foods at least twice a day. Would I benefit from protein shakes post-run? If not straight away as the training really picks up? Hi Maxine, we have a section in this post for figuring out your half marathon protein intake, and your marathon intake. It depends on what training you are doing, so this would be the best way for you to determine if you do need more, but if you are getting protein through your diet, you should be okay! I am quite a fat person. I go for soccer training twice a week. The training is 3 hours per session. 1 of the days is fitness. After running for 1 round I get so tired And I pant for my breath. I decided to take protein shake. I also want to slim down. I also want to get alot of pace And stamina for playing soccer. Which protein shake should I buy to slim down And get alot of stamina without panting for breath.is there any protein shake like That? I am 13 years old. Hi Hari, thanks for reaching out. You are probably starting out these runs too fast. Try running a little slower, and you will feel more comfortable (and it will take time for your endurance to build). Protein is not a quick fix, and this post will explain that in better detail if you want to go back and read it again. Your best bet is to just keep up with the soccer as that is what you enjoy, and eat wholesome foods with protein in after your training sessions. Hi Racha, you are best off just following the guidelines in this post, you do not need protein shakes, but just to find wholesome, natural sources and probably increase your caloric intake to around 1500-2000 per day. Hey I’m a 16 your old dude im 5’9 and weigh 63.5 kg I run 8 light miles in the morning 5 days a week and do an intensive run (half mile repeats, hill repeats, etc.) 3 times a week on top of the 8 miles in the morning. is it fine if I eat 20g protein bar run a miles eat a big breakfast then continue my day at work with a 30g protein shake then eat lunch(which should have 20g. Of protein) then continue my working then go out for my intensive workout then after wards drink another 30g then eat dinner? Hi Robert, are you asking us if that is too much protein for what you are doing? As long as you make sure you are getting the carbs in with that protein, the amount you mentioned is not too much. Although you may want to read this post https://runnersconnect.net/running-nutrition-articles/protein-and-calcium-for-muscles-and-bones/ hope this helps! I’m 55 year old female, going to try my first half marathon in November. I weigh 128, I get confused how much protein to take before or after a run. Hi Gloria, thanks for reaching out. We actually gave you a way of calculating this in the post. If you weigh 128llbs, then you should be taking in at least 82g per day. Hope this helps! Hi Amanda, thanks for reaching out. Glad you have found that the protein shakes help you with your runs, and will mean that you can continue improving as time goes on. As for protein after your run, it would be best to consume a more natural source of protein such as a lean meat, some greek yogurt, or cottage cheese following your run. Use our calculator above to measure your recommended protein intake, and keep your intake around our recommendations, subtracting your 16g protein from your total. Hope this helps! Hello! Eight months ago i started running. I have learned that my body takes a long time to digest food. I have back my dinner time to 3pm so that i can run at 7pm. Otherwise I suffer from indigestion and belching. Im 47 year old lady and dont know if its my age or if i just that i have a sensitive stomach. I have tried eating different types of meals befor my run from a bowl of raisin bran to a grilled chicken breast. Many nights nothing to avoid the discomfort. After reading your article i decided to a banana blueberry shake a try at 5:30 the ran at 7pm and to my excitement… no indigestion! Happy happy me. Now id like to add the protien to my shake but there are so many that i am a bit over whelmed by it. How do i choose one? And is acid indigestion during exercise common? Hi my name is Rajinder Singh, I am currently 6 feet tall and 160lbs weight. My question is that should I cut my weight to 150lbs or at 160lbs just do weight training so I turn the fat into muscle. I just don’t want to be 170 lbs and be a slow runner. If I do weight training at 150lbs I would be 160lbs. Does this effect my speed. 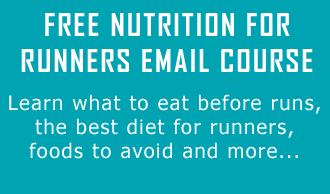 Hi Rajinder, we cannot make recommendations on whether you should lose weight, but we can show you this article if you feel you do want to https://runnersconnect.net/running-nutrition-articles/weight-loss-running-performance/ although it is not guaranteed that you will run faster, training correctly is the best way to ensure you are able to run faster. Hope this helps! My weight is 63kg tall 6ft age 25. I thin have starting running and also njoy it… So I run for almost 4km twice week. Which protein exactly should I intake to gain weight or recover muscle. (I dnt do go to gym). A protein can be assimilated to a necklace composed of elementary pearls. Each pearl represents an amino acid. Know that there are 9 essential amino acids. An essential amino acid can’t be synthesized by the human body. It is therefore essential to bring it through food. So proteins are provided by various foods that also provide other nutrients such as carbohydrates, fats, vitamins, and minerals. Nutrient composition is specific to each commodity, the problem of a balanced diet is based on the choice and dosage of each food. we need a constant supply of protein through a balanced daily diet, but also punctual contributions after a run which could have damaged the muscle fibers. we can get proteins during the main meals, but also during recovery after workouts. BCAAs play a vital role in regeneration during the recovery phase. During a long effort, the problem is different. A recent study suggests that BCAA supply before exercise can reduce the muscles damage.